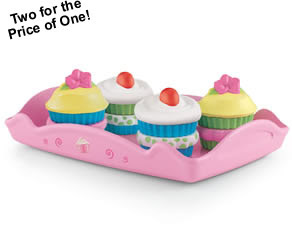 This adorable little cupcake set is normally priced at $19.98 at Step 2. However, today only, you can get 2 of them for $19.98, which makes them only $9.96 each! You will have to pay shipping of $7.99 – but you are still paying LESS than full price — and getting 2 for 1! Not sure what to do with 2 of them? Why not keep one and donate the other to a worthwhile charity this holiday season?